The Amazon Sumerian editor uses locks to control modifications to a scene. When you open a scene, the editor creates a lock on the scene and refreshes it periodically. If you try to open the scene in a different browser while the lock is active, you will see an error. 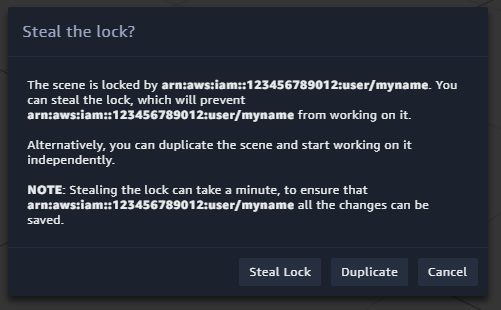 You can force Sumerian to discard the lock if you are sure that no one else is working on the scene, or create a copy of the scene and work on that.